My last post was two weeks ago…and this is why! We surprised our daughter with “Louie” for her birthday. My kids have always wanted a dog, but I have never given in to the desire. It always sounds fun, but then I talk myself out of it. I am a pretty logical person. Always thinking about the things that would make me not want a dog. For some reason, those things didn’t seem as important recently. I thought if we were ever going to get a dog, now would be the time. HOLY CRAP! THIS PUPPY STUFF IS CRAZY! There are moments (many) where I wish I had listened harder to that logical side of myself. I honestly had NO IDEA how difficult puppies are! I talked to lots of people and no one told me it was like having a newborn. Why did they not tell me?! All the biting, jumping, and running around with crazy energy was not what I was expecting. It is cold here and I can’t wear long pants without getting teeth marks in them. Thank goodness this puppy is so cute. Waking up super early to take him outside is a little better with all that sweet fluffiness to cuddle up to. I have learned a lot about myself these last two weeks. 1. I LOVE my sleep! I think I already knew that, but it has been proven these last two weeks. 2. I like to be in control of things around me. Puppies are hard to control! We are enrolled in a puppy class that starts this weekend. I am hoping that will help me get some control of this fluffy thing! But I have a feeling, the real lesson here is that we never really have control, do we? I just thought that I did and Louie is teaching me otherwise. 3. I still have a temper. I thought I had better control of that, but bringing such an uncontrollable thing into my life made me realize it was still there. Ugh…will have to work on that one. 4. I will go through A LOT for the happiness of my children. My daughter is in love with Louie! Seeing her so happy, makes me happy. 5. When I am responsible for a “new” living thing, I become a little crazy! I was so worried that I was doing the right thing with the dog that my stomach hurt for the whole first week. I didn’t feel like I could go anywhere or do anything except puppy stuff. I actually lost 3 pounds! Week two is getting better and I hope it just keeps heading that way. It’s hard to get a clear shot because he is never still! These are the moments that make it all worth while! So I am curious if you have a pet…what kind of pet is it? Do you take it with you on your travels or board it? Would love to hear your story. Oh, the beginning of puppy hood! Fun, isn't it? I have an Italian Greyhound (aka bundle of high energy and very needy dog). I had never had a dog before him. I got him at 14 weeks old, and yes, he was like a real baby. The whining and crying and pottying all over was crazy for a while. But just like kids, they grow up and grow out of the craziness… eventually. Thankfully, dogs are loving and amazing creatures that nurture your soul. I can't live without my dog now, no matter what he happens to chew or eat these days (yeah, just wait until the chewing stage begins!). As far as travel, since my dog is a toy breed, I take him everywhere when I can. For Christmas, I'm flying him with me on the plane (we'll see how that goes…). When I go shopping, he always comes along in the car if it's not hot. He's my little travel buddy and travels very well. He's taken a 20 hour road trip twice as a puppy and did amazing! I have a lot more info about my dog and his story on my blog. Thanks for sharing and best of luck with Louie! PS He is my first dog as well. I think that is why I was so shocked at how much work it is. My dog's name is Louie too!!! 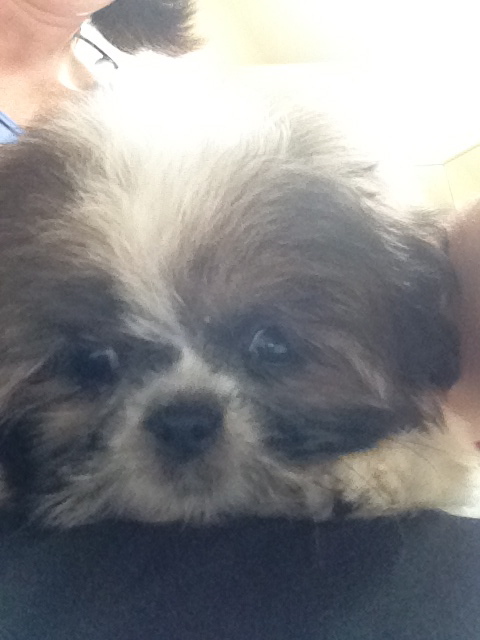 My dog is a shih tzu and his name is Louie too…..the name attracted me to your youtube video then to this blog! He is 4 years old and he is cream/beige and white…..and let me tell you, I do not miss the puppy stage! But don't worry as they get older they become more mature and well behaved (if you train them). So glad you found your way here! I would love to hear about your trip and how your Louie did! Three months is a long time!